British artist Es Devlin has been selected to design the UK Pavilion for the upcoming 2020 Dubai Expo. Known for working with a range of media – often mapping light and projected film onto kinetic sculptural forms – Devlin is the first woman to be awarded the honour since the contest’s inception in the mid-nineteenth century. The pavilion’s design will showcase Britain’s contributions to the artificial intelligence (AI) and space industries. 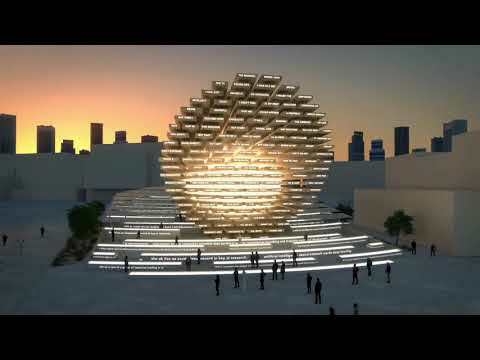 The dramatic structure will rise 20m (65ft) with LED-powered poetic verses decorating the design. “The idea draws directly on one of Stephen Hawking’s final projects, ‘Breakthrough Message’, a global competition that Hawking and his colleagues conceived in 2015 inviting people worldwide to consider what message we would communicate to express ourselves as a planet, should we one day encounter other advanced civilisations in space,” said Devlin. Hawking, who articulated the cosmic-themed “Initiatives” in 2015 along with physicist Uri Milner and others, encouraged people to think of the human race as a planetary collective rather than as a globe of individuals separated by nations and creeds. 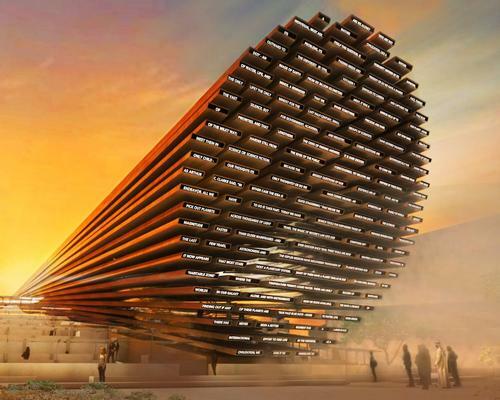 “What if the UK Pavilion at Expo 2020 became a place where visitors from all over the world chose to take part in a collective global project that showcases British expertise in AI technologies and poetry while transcending national identities,” added Devlin. The pavilion will be produced by the design studios Avantgarde, Atelier One, and Atelier Ten, will be supported by the UK’s Department for International Trade. During the six-month Expo, it will be exhibited to an estimated 25 million visitors. “The quality of design proposals we received for the UK Pavilion were testament to the UK’s world leading creative talent,” said member of parliament, Liam Fox.